Retro fashion is fun. This hooded poncho in the 1960s style is perfect for today’s girl. The Poncho slips over the head with yarn poms poms for ties. So sixties! If you prefer a current take on a poncho, use ribbon or a clasp in the front. View 2 has a Cowl Neck with an easy one-piece hat. For both views the front and back can be cut on the fold, or on the bias to create a “V” in the front. Fringe can be cut when using a non-fraying knit, or you can turn it under and hem it. Add a trim or a lace for a different look. It’s an easy over the head style even the younger kids can do and loose fitting so it will fit most 14-14.5” dolls. ﻿This PDF sewing pattern was designed to fit 14-14.5" doll such as Hearts for Hearts Girls® and WellieWishers™. 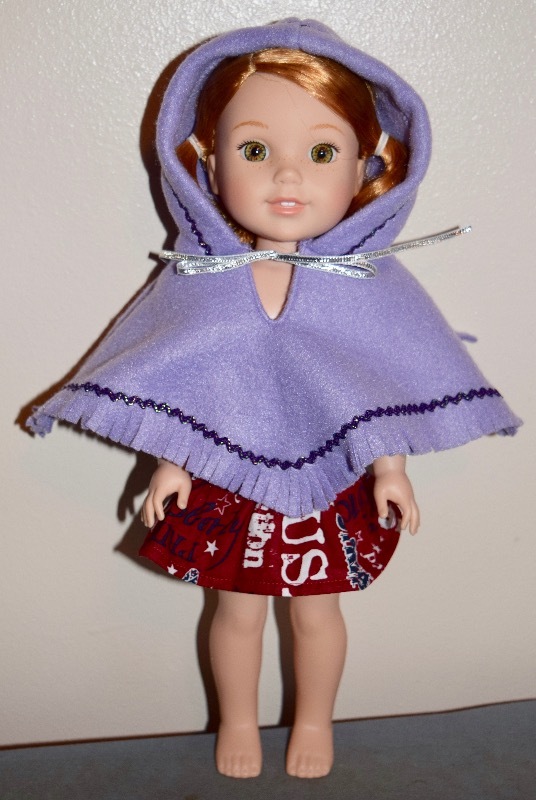 Please view our other listings to see this pattern for 18" dolls such as American Girl®. • Knit Fabric – ¼ yard with center seam, may need extra to match stripes. I think she looks adorable in this outfit. It was a quick and easy pattern. What a cute pattern, it sews up quick and is so cute.